From The Artistry of 3D, now we’ve got fashion with a futuristic edge. With graphic shapes and neon colours, we’re pushing forward to the era of science fiction, the kind of world which first spawned the idea of 3D printers. As soon as I knew I was going to write about 3D printers, I knew I wanted to put together a futuristic, scifi-inspired outfit. This immediately made me think of graphic, brightly coloured shapes and prints. My mum passed down this Claude Montana dress a while ago, but I’ve always been too terrified to wear it because of the fluorescent colour, but for this it was perfect, reminiscent of The Fifth Element almost. I accessorised with extremely shiny black nails and Office shoes, trying to bring an element of plasticity to the whole thing, being the material which is firstly one of the most commonly used in 3D printing, and also one of the most popular materials of modern times. The gold Accessorize cuffs were added partially to stop it all looking like Halloween dress up, and partially for the graphic edge they added. 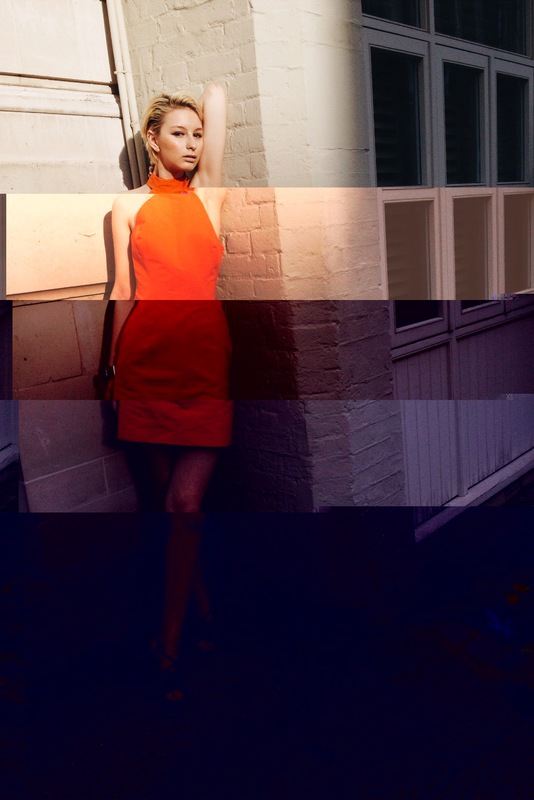 I wanted to play with the editing of the photos, partially inspired by Nick Knight’s iPhone editing, and so (after downloading about six different Glitch apps) I settled on using Glitch.Simply to bring a distorted post-modern edge to the whole thing, as it was ridiculously easy to use (hence the name), and also created a kind of ‘printer error’ effect that I thought fit very well with the theme. Especially as this look was put together and shot quite hastily due to my exams, I thought it’d be good to try and add something different to the look through the editing process. I really like this outfit – I think however I’d maybe want to develop it slightly more before it would be a very good ‘night out’ outfit, possibly by experimenting with different shoes and nail colours, and looking at other accessories. Even so, I’m very glad I finally put the amazing dress to use! This look was shot in South Kensington by my lovely friend Noor, who’s been an absolute star at helping me out (slightly easier as she lives in the same building as me!). Even though I’ve finished exams, I’m still bogged down by project work at the moment, meaning that things are still a bit rough around the edges – but I now have time to actually do something, which is an improvement on last week! Hopefully in the next few weeks the quality of my posts will be improving massively, as I’ll have far more free time on my hands, so you can look forward to that. Studying physics at Imperial College in London, Alexia hopes to go into science communication, and help to show to creative side of science to the world. In her spare time, she enjoys ballet and the occasionally modelling job, having worked independently for photographers such as Nick Knight.